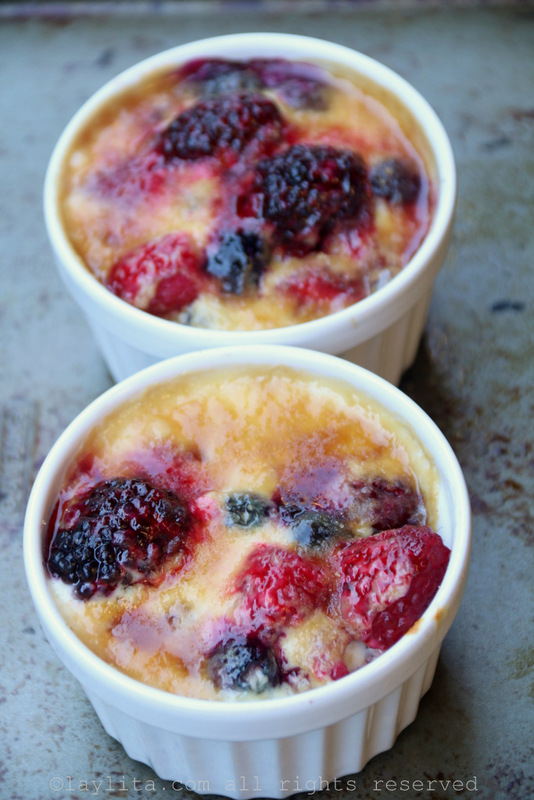 This dessert of mixed berries broiled cream is one of my favorite easy summer desserts. 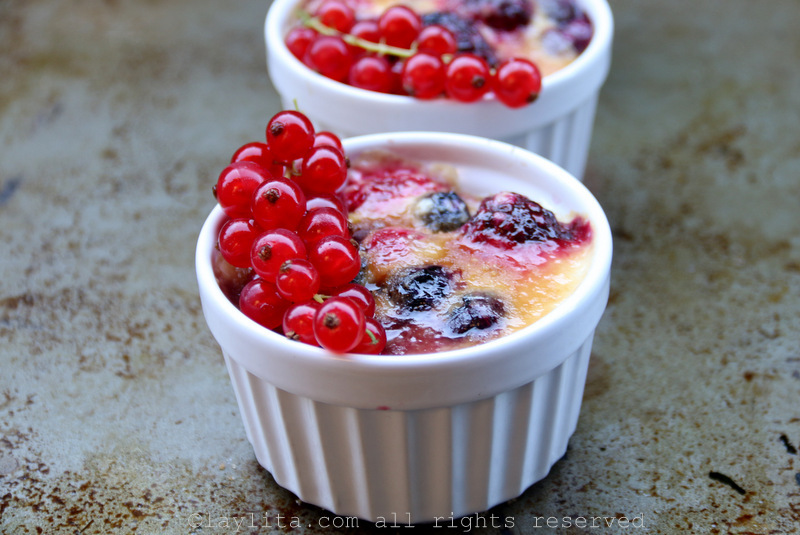 I would also call it a cheater berry crème brûlée version or an eggless berry crème brûlée. 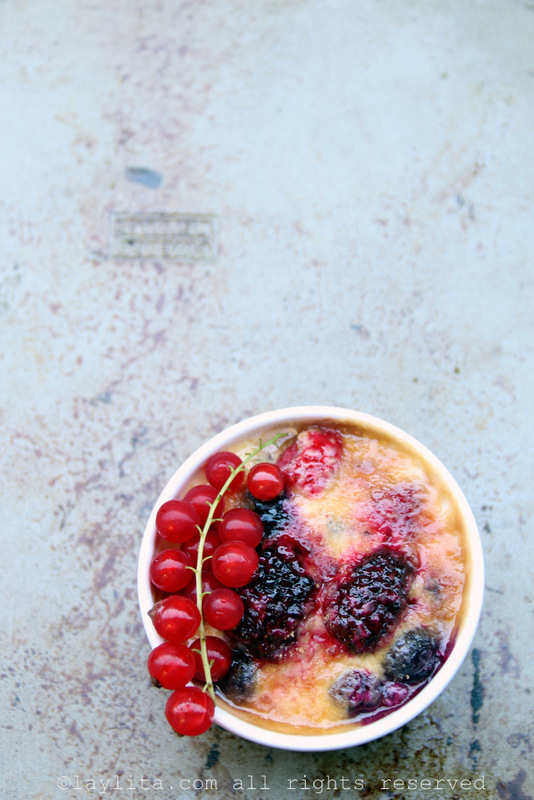 I’m not that good at making desserts, so this easy berry dessert fits my style perfectly. It’s very simple and the prep work can be done ahead of time. 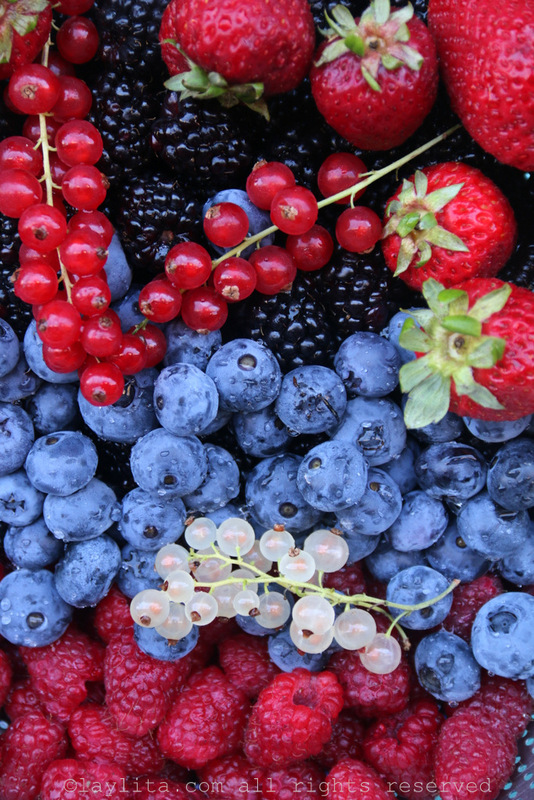 It makes great use of the delicious berries that you find at the summer farmer’s markets. 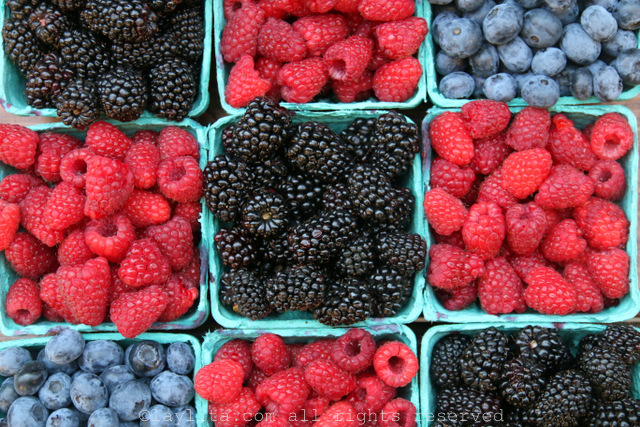 I feel very spoiled by the great variety of berries that are available in the Seattle (Pacific Northwest) area during the summer time. I used a mix of raspberries, blueberries, blackberries, a few sliced strawberries, and fresh currants to garnish. 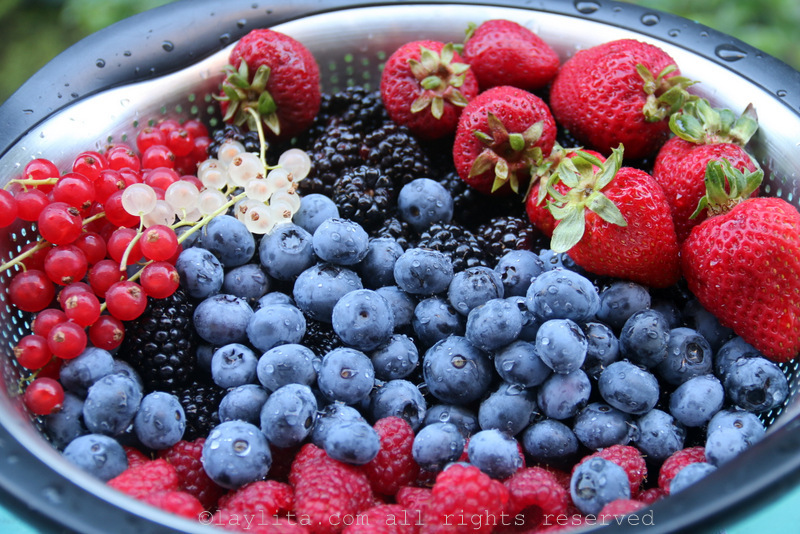 You can use the berry mix that you prefer or that is available where you love. 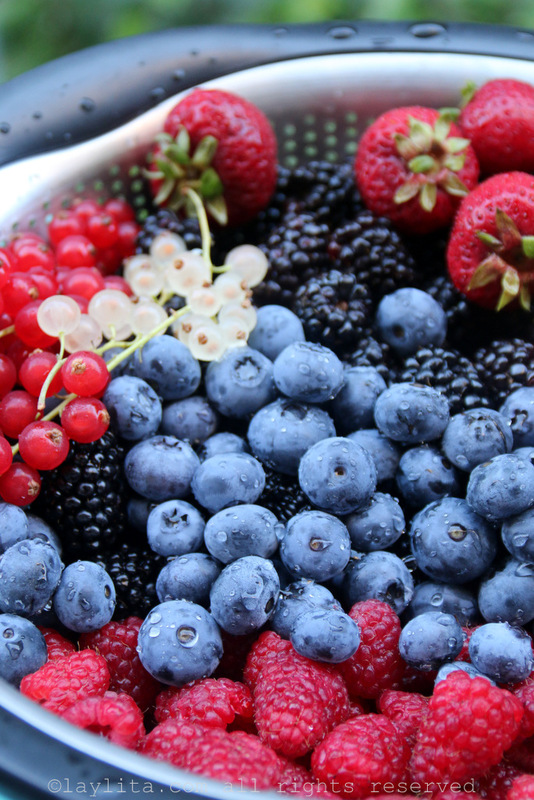 And you can even replace the berries with other fresh fruit; it’s a very flexible dessert. 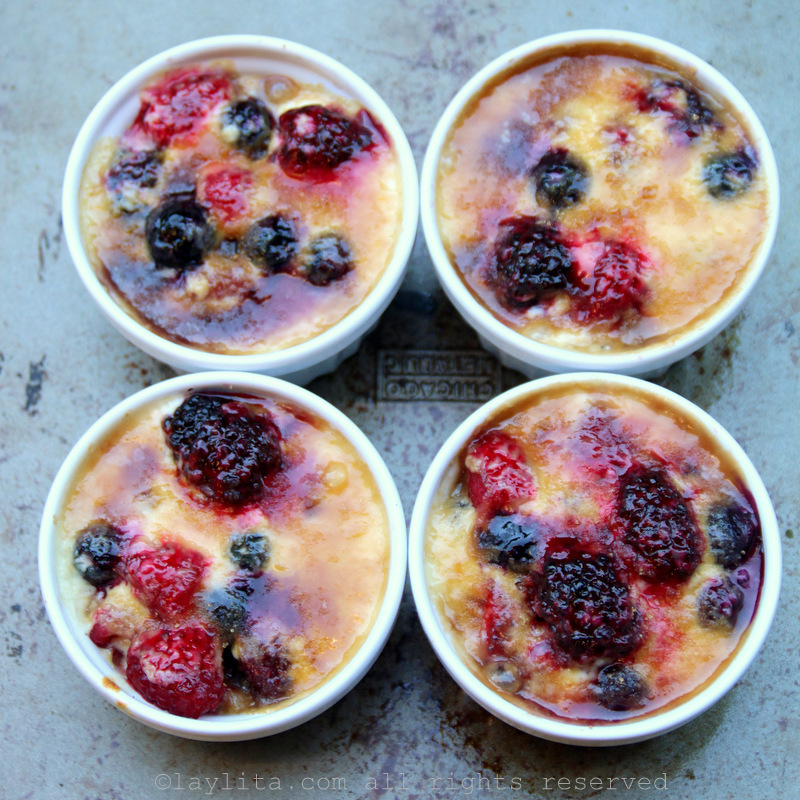 Mixed berries broiled with cream, also known as cheater berry crème brulee, made with assorted mixed berries and covered with a sweet cream sauce, topped with brown sugar and broiled until the sugar caramelizes. In a small bowl, mix the crème fraiche or yogurt, cream, vanilla and 2 tablespoons of sugar until well combined. 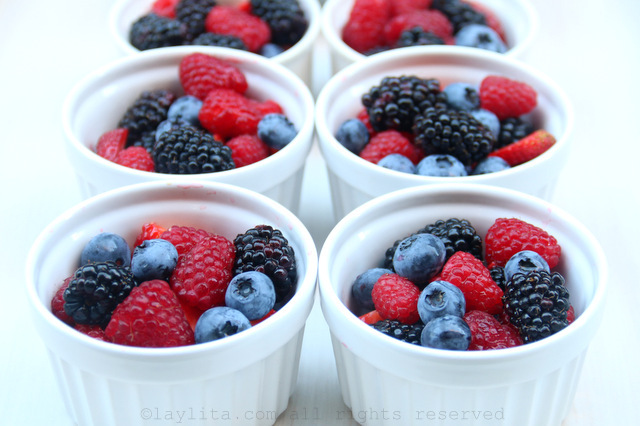 Distribute the berries in the 6 ramekins or small oven proof containers. 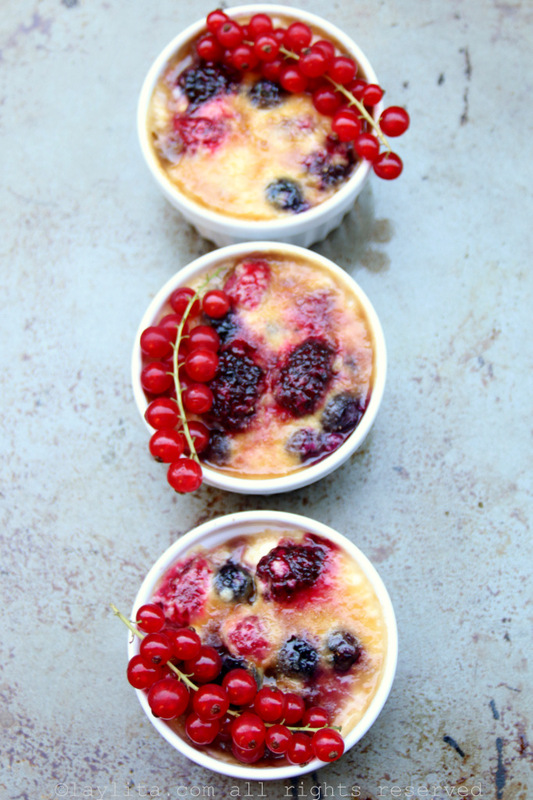 Arrange the berries in a way that small spaces are left in between to allow the cream mixture to seep through. 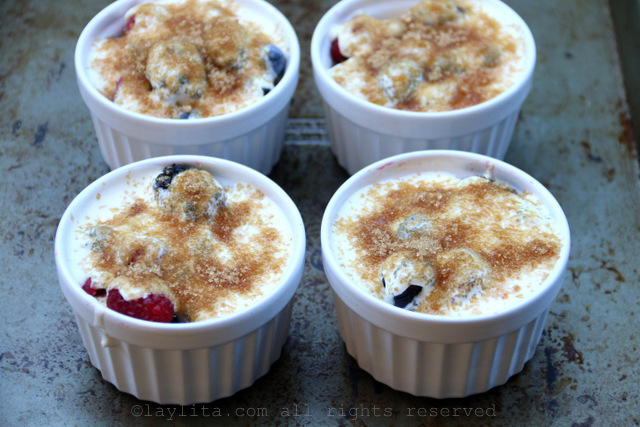 Spoon the cream mixture over the berries (don’t overfill them if you don’t want them to overflow while broiling). Sprinkle ~1 tablespoon of brown sugar over the cream on each dessert mold. 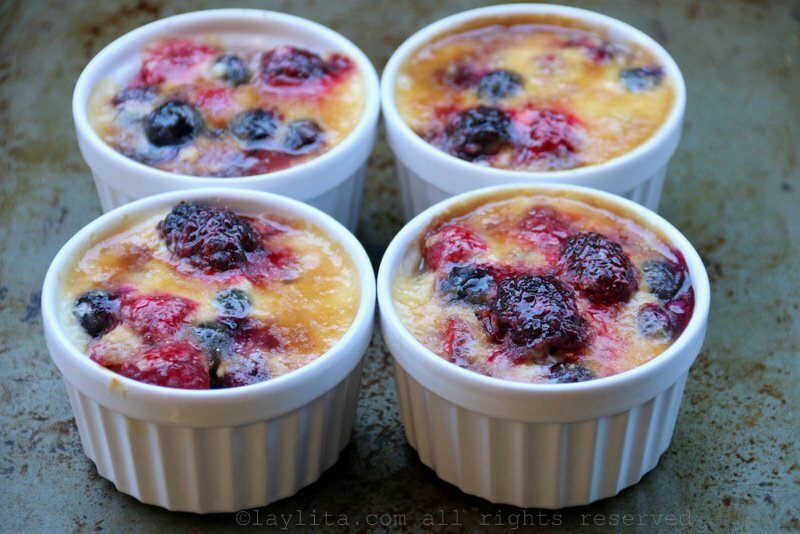 Place the ramekins or dessert molds on a baking sheet, this makes it easier to put them in and take them out of the oven, and will protect your oven in case there are any spills. Turn on your oven broiler and place your oven rack as close to the broiler as possible. Place the baking sheet and ramekins in the oven and broil until the sugar begins to caramelize, about 4-7 minutes (depending on your oven). Serve immediately. 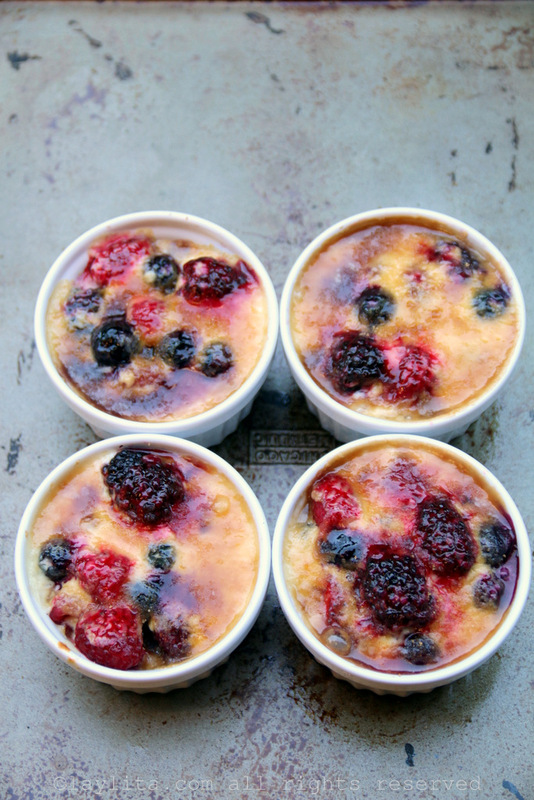 Can be made with any variety of berries (or other fruit) that you prefer. 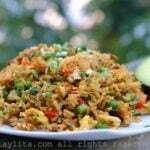 When I prepare a meal, I put all of my effort and time into the appetizers, main meal and side dishes. Usually just thinking about making dessert leaves me exhausted. Of course, if my only task is to prepare a dessert, then I can easily spend a whole day only making a dessert, but find it really challenging to prepare both a full meal and a time consuming dessert. I’m naturally more into the salty tasting stuff than the sweet stuff. This doesn’t mean in any way that I don’t enjoy something sweet. I am completely envious and impressed with my friends who make awesome looking desserts (and they know that when they’re invited over to dinner and ask what they can bring, I will take full advantage and ask them bring one of their amazing creations). I probably eat fruit or chocolate or ice cream at least once a day, and I’ve been known to grab a spoon and a jar of nutella and almost finish it (however unlike Nicolas and the boys I can’t bring myself to eat bread and nutella, I have to have cheese or something salty with my bread). Also, I can’t just say “no desserts”, especially when I have a 5 year old whose main incentive for behaving throughout the day is knowing that the reward will be a dessert (surprise me he says when I ask him what he wants for dessert, and yes, I know that bribing kids with food and candy is probably wrong, but I still do it). I also learned, that unlike us Ecuadorians, French people usually expect some sort of dessert after dinner, it doesn’t have to fancy or complicated, just a little something sweet to finish the meal. I know how to make a few desserts and most of them are very easy and simple. Of course, sweet empanadas and tarts are right in my comfort zone, and I grew up with a mom who baked every day (and still does). I am trying to be more creative and experimental in the dessert area (which means there have been a few disasters but at least they contain sugar so they are still consumed). 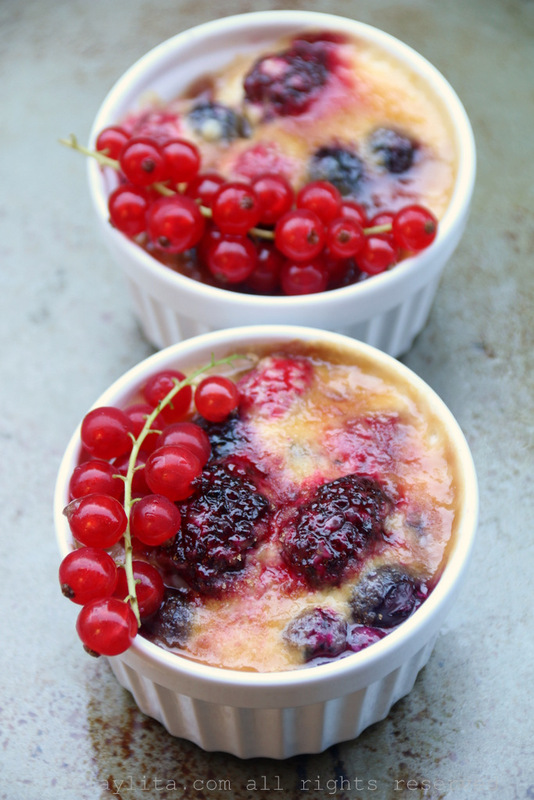 This dessert of mixed berries broiled with cream is very easy and foolproof. 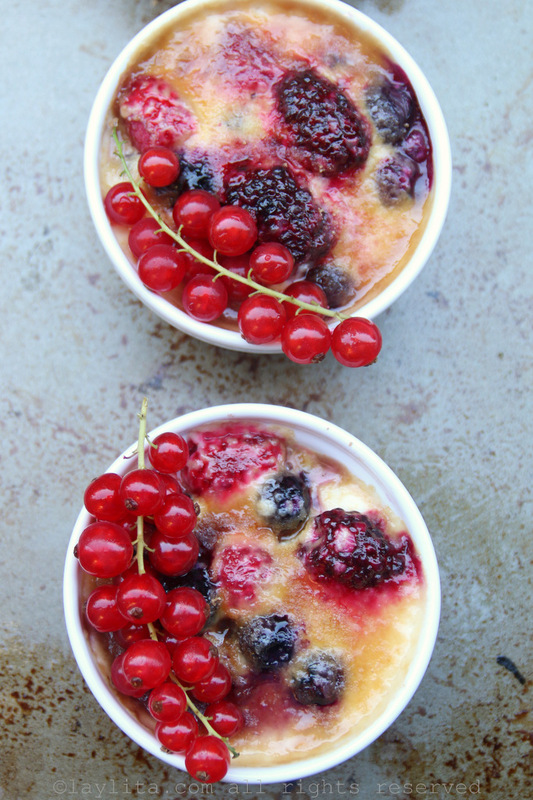 The components, ie the berries and the cream, can be prepared almost entirely in advance. I used a combination of crème fraiche and regular heavy cream, but have also made it with yogurt in place of the crème fraiche on occasions or locations where I can’t get crème fraiche. For the ultra-healthy version you could make it entirely with yogurt. The final assembly and broiling can be done right before serving. The finished dessert looks somewhat like a crème brûlée, but the filling does not contain eggs and is extremely simple to make. 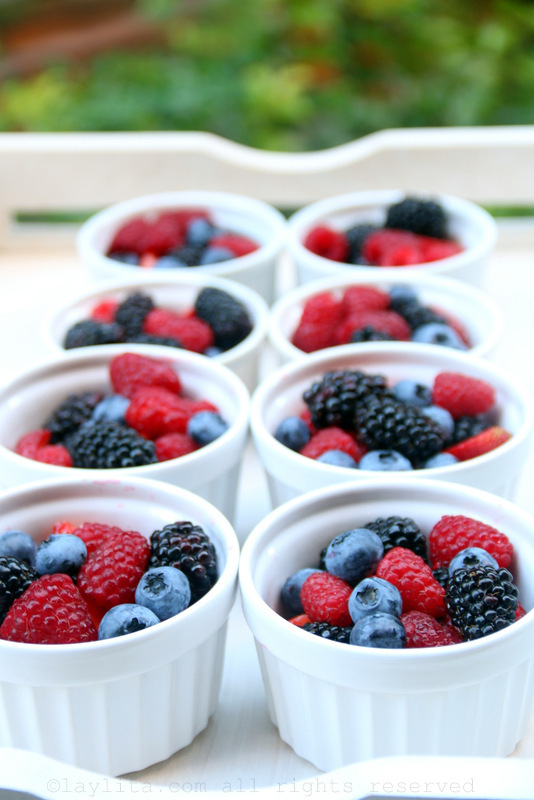 The best part is that they taste delicious and are full of summer berry flavor. 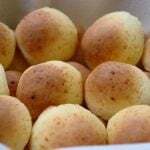 mmmmmmmmmmmmmmmmmmmmmmm, deliciosos!! !, me encantan los muffins y con frutos rojos más aún!! !